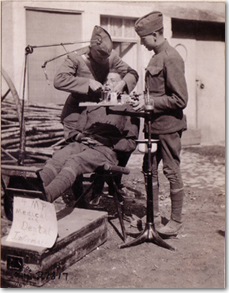 While unpacking my household goods from my most recent Permanent Change of Station (PCS), I came across part of an old presentation I gave in the Officer Basic Course on the History of Army Dentistry. I noted some interesting statistics about the US Army Dental Corps and the wartime service of its dentists. During WWII there were 15,292 dental officers on active duty in the US Army. 20 were Killed in Action, 5 more succumbed to wounds received in contact. 10 died in captivity. 81 died of disease and non-battle injuries. One dentist, CPT Benjamin Salomon was posthumously awarded the Medal of Honor. That brings the total number of Army dentists who died while fighting overseas in WWII to 116. In the Korean war there were 2,641 dental officers of whom 370 served in conflict. 2 were KIA, 2 were Missing In Action of which one was declared dead. During the conflict in Vietnam there were 2,817 dental officers. 290 were in Vietnam at any given time. 4 dentists were killed and 4 dental assistants were killed. Currently the US Army Dental Corps has about 1,000 dental officers. I have no idea how many have served in the Global War on Terror in Iraq or Afghanistan, but none has died. One dental assistant was killed in Iraq when the helicopter he was riding in made an emergency water landing.